Movie magazines are an invaluable resource to silent film scholars and fans alike. Join noted author and researcher Annette D’Agostino Lloyd as she describes the fascinating story of one of the most important such publications. This essay originally appeared in the inaugural issue of Silent Film Quarterly, the only print publication dedicated exclusively to the early days of cinema. Chances are, if you are reading this, you are a dedicated silent film student and/or chronicler. And if that is the case, chances are even greater that you have, at one time or another, benefited from the insights preserved within the pages of the granddaddy of all film magazines, The Moving Picture World. If you haven’t…well, I’m here to make your work a lot easier. I first met this marvelous trade journal in 1993, while working on my first academic tome on Harold Lloyd. I needed reviews of Lloyd’s earliest films, dating back to 1913, many of which are not available for me to personally assess. I decided to peruse all of the magazines of the day, and found MPW to be the best of them. So entranced was I of this lovely little journal that I decided, after finishing the Lloyd book, to compile two indexes to assist researchers in using MPW. More on that later. 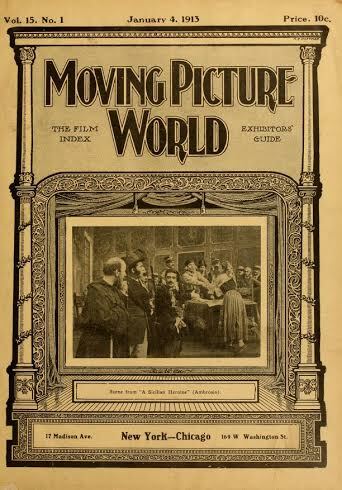 First published on March 9, 1907, and remaining in circulation until December 31, 1927, The Moving Picture World offered 1084 issues, and 108,798 pages of information which, now, is film history. The 89 volumes averaged 1222 pages per volume, and each issue averaged 100 pages. Based in New York, the MPW had a Spanish-language sister publication, Cine Mundial, and, over its nearly 21-year run, boasted the highest circulation of all similar periodicals. It merged with one of its competitors, Exhibitors Herald, in 1928. The idea for a magazine called “The Moving Picture World” came, in a small office at 361 Broadway, New York, to James Petrie Chalmers, Jr., editor of the photographic publication Camera and Dark Room, and Alfred H. Saunders, editor of Views and Film Index, more commonly known as The Film Index. The first issue cost five cents, and contained sixteen pages, with three and a half pages devoted to advertising. The cover of Volume 1, Number 1 introduced the concept: “The Moving Picture World and View Photographer: The Only Independent Weekly Journal Published in the Interests of Manufacturers and Operators of Animated Photographs and Cinematograph Projection, Illustrated Songs, Lantern Lectures and Lantern Slide Makers.” The March 9, 1907 editorial article explained the mission of this new paper: “It is our intention to give the best, and only the best, news concerning the film industry, describing briefly each new film as it is produced, taking note of its quality, and giving an unbiased opinion of its merits or demerits.” Twelve thousand copies of the first issue were printed. They were all gone in a week. 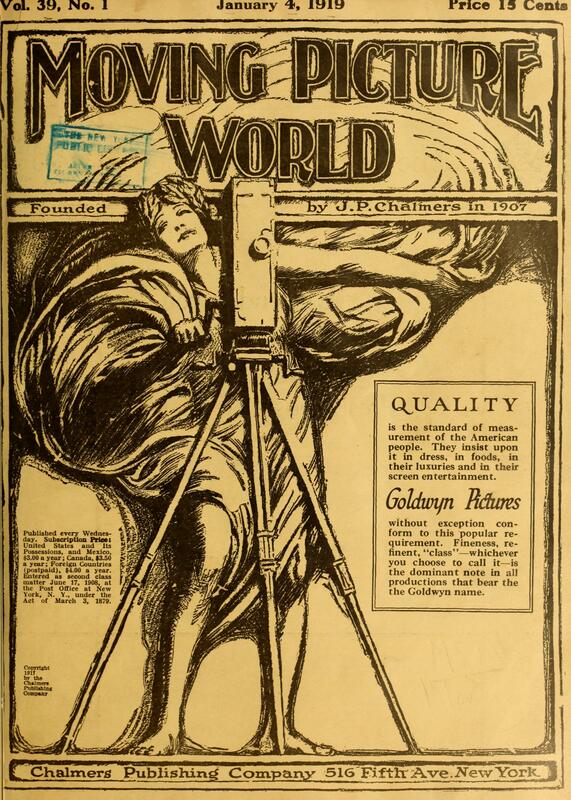 The Moving Picture World was founded by J.P. Chalmers who, in the words of John Chalmers (later President of the Chalmers Publishing Company, distributor of MPW since 1912), “was privileged to lay the foundation of character and the high principles of independence, service, fair play and rugged honesty from which, we who have followed, have never departed.” J.P. Chalmers led the publication until his untimely death at age 46, on March 27, 1912. He was attending a film convention at Dayton, Ohio, and his death resulted from a tragic fall down an elevator shaft: he thought he was entering a film projection booth, which similarly had sliding doors. In June 1911, The Moving Picture World acquired The Film Index, which had been founded by William T. Rock of the Vitagraph Company and Jacques A. Berst of Pathe Freres. Originally a house organ (or, a magazine which listed the releases of a particular company), in 1909, when the Motion Picture Patents Company was formed, The Film Index became the organ of this company. Absorption of the Index by the MPW was a significant step in cinema history. While The Moving Picture World laid claim to being the first actual motion picture trade paper in America, it then merged with the first paper devoted to the films themselves. The focus became the trade and the films. The various covers of The Moving Picture World reflect this. After a most bland initial series of covers, with stark advertising their hallmark, the trademark double pillar cover debuted on September 2, 1911. At first, the ornamental frame held a still from a film. As this was not particularly profitable, the cover, clearly the most valuable advertising position in the paper, resumed being devoted to trade advertisements for the remaining 16 years of its run, even as the basic cover formats changed. As ever, the emphasis was on the films and the companies making them—never did a player portrait appear on the cover, unless in an advertisement for a film. The articles found in The Moving Picture World are markedly different from the typical “fan” magazine, for the simple reason that the periodical was not aimed at the film fan, but rather the theatre owner or the exhibitor who showed the films. The articles have an almost business-like frankness, simplicity and pointedness, and exhibitors relied on it for data which, more often than not, would be used in the publicity, or “exploitation,” of a company, film, or star. There was little to no “fluff,” and for that reason the journal came to be depended upon as a reliable and trustworthy source of factual and believable information on those persons, industries, films or innovations that were covered. Within the pages of The Moving Picture World are data that, perhaps, can be found nowhere else—dates of marriages, places of death, film debuts, honors, etc. In the two MPW indexes that I published, I tried (and hopefully succeeded) to make MPW more accessible and easier to work with. My first book indexed the “un-indexed” years of 1907-1915 (starting in 1916, the year-end issues contained a sketchy, but still helpful, index of the year’s articles). My second MPW index took two years to compile: I read each issue, and listed all articles on “filmmakers,” which included before- and behind-the-camera personnel who actively made the films (I did not index the exhibitor-related articles). Both of my MPW books were books I needed while doing the first Lloyd book—I have been blessed to refer to my own books on MPW while doing subsequent research on all things Lloyd. I’ve been gratified to hear from many fellow researchers who told me that my books have made their work easier. That was my goal. In the March 11, 1922 issue of The Moving Picture World, the “Fifteenth Anniversary Number,” several notable film luminaries offered statements of praise to the journal: “vigorous,” “just,” “a credit to the industry,” “honest,” “unbiased,” “fearless” – sentiments indicative of the silent film industry‘s feelings about, and dependence upon, The Moving Picture World. Two decades have gone by. Twenty years of motion picture history—all of them years characterized by hectic activity…. Throughout this span of time Moving Picture World has endeavored to serve a great art-industry honestly, fairly, and to the best of its ability. It has consistently maintained and protected its right as an independent publication to present its own editorial views. On December 31, 1927, page 7, an announcement was released by John F. Chalmers: “With this issue Moving Picture World concludes publication as an individual trade paper and becomes merged with Exhibitors Herald. The combined publications will be published under the joint title, Exhibitors Herald and Moving Picture World.” Thus ended a nearly 21-year run, with 89 volumes accrued, and 1084 issues published. In summing up attempts to copy the services provided by The Moving Picture World, Chalmers concluded, “They have all lacked the all important ‘know how’ and complete familiarity with the subject which so easily distinguishes a winner from an ‘also ran. '” The researcher of today can still depend on The Moving Picture World for hard information, particularly in light of the film preservation movement, and the exciting rediscovery of thought-to-be-lost classics. Ready to dig in and discover my favorite silent film trade journal? Here’s how: visit mediahistoryproject.org/collections, where (so far) the marvelous team of dedicated professionals at the Media History Digital Library has scanned each issue from 1907-1919, with plans for more. (I wish they had been around when I was building my indexes; I used microfilm and hard copies, along with pencils and index cards!) Never before has it been easier to use and enjoy The Moving Picture World, where, truly, everything old IS new again! Annette D’Agostino Lloyd is a silent film historian and the foremost biographer of actor Harold Lloyd. Author of such books as The Harold Lloyd Encyclopedia, Hollywood Forever Cemetery: The Official Directory, and two indices of Moving Picture World magazine, Lloyd is a prolific writer on the subject of silent cinema. She also served as the Celebrity Biographer for Hollywood Forever Cemetery, has appeared in numerous documentaries, and provided several audio commentary tracks for Harold Lloyd’s films. Annette Lloyd currently lives in Rhode Island with her husband and son. For more information, visit haroldlloyd.us. Silent Film Quarterly is the only print publication dedicated exclusively to the early days of cinema. Featuring original content, reprinted material from the silent era, movie reviews, and interviews, the magazine is dedicated to preserving and celebrating all aspects of silent movies. Contributions have already come from some of the leading scholars on the subject. Its inaugural issue is out now. For more information or to subscribe, visit silentfilmquarterly.com. Silent Film Quarterly is on Facebook at facebook.com/silentfilmquarterly. For more essays like this one, plus film preservation news and special discounts, sign up for the Flicker Alley Newsletter.